This portrait is painted in pastel, a form of manufactured chalk. Strictly speaking chalk is natural soft stone or earth of limited colours; white, black and reds. In the 18th century pastel was called crayon, which today is a term for any manufactured drawing material in stick form, although it increasingly indicates pigment mixed with a fatty binder. In contrast, pastel is a coloured crayon made out of pigment mixed with a water soluble binder such as gum. Pastels are made by mixing the pigments and binder to form a paste which is rolled or pressed into sticks and then dried, usually simply near a fire. Pastel probably came to be thought of as a form of painting rather than drawing, because the colours are applied in masses rather than in lines and are blended. There are two versions of this pastel by Hugh Douglas Hamilton. It seems likely that Hamilton painted this version for exhibition. Such an ambitious pastel would have advertised Hamilton's exceptional skill in what was thought of as a more modest medium. It is outstanding in terms of size, grandeur of conception and quality of finish. It pushes the medium of pastel to unprecedented heights and is a milestone in the development of pastel as a public art form, seeking to compete in visual terms with oil painting. Portrait of the neo-classical sculptor, Antonio Canova (1757-1822) and the art dealer Henry Tresham (1752-1841), later Professor of Painting at the Royal Academy. Canova leans against his model for "Cupid and Psyche", wearing a red jacket with a mallet in his right hand. Tresham wears a brown jacket with a blue waistcoat and stands to the right of the model they are discussing. To the far left is a table of sculptors tools, including another mallet and some files. Pastel on paper. (The paper is then likely to have been pasted to textile, the textile then nailed to a wooden stretcher (frame). Canova arrived in Rome in 1779. Amongst his close friends were British artists such as Gavin Hamilton and John Flaxman who were then developing the new neo-classical style. Amongst his earliest patrons was Colonel John Campbell, later 1st Earl of Cawdor (1755-1821), who commissioned from him the famous "Cupid and Psyche". Canova had finished the full size plaster shown in this pastel by September 1787. By October 1789 he had rethought the design and added Cupid's large wings - such a distinctive feature of the final marble group - which was not finished until 1793. Delays in shipping the piece to Britain led to its seizure, following the invasion of Rome by the French, by Joachim Mura (Napoleon's brother-in-law) from whom it passed to the Louvre. Cawdor supported contemporary artists in Rome and was also an avid collector of antiquities and Greek vases. Like some other admirers of advanced Neo-classical sculpture he had an eye for early Italian painting which was then being rediscovered - he owned Bellini's "Doge Leonardo Loredan", now in the National Gallery. One of Cawdor's dealers was Henry Tresham (1751-1814) who is seen in this pastel on the right in a contemplative pose. Like Hugh Douglas Hamilton, the painter of this pastel, he had been born in Dublin where he trained and worked as a portraitist and history painter. He arrived in Rome by September 1775 and remained there until March 1788. As can be seen from the provenance, the early history of this pastel is uncertain. Another but now badly damaged version belongs to the present Lord Cawdor. One of these pastels was exhibited by Hamilton at the Royal Academy in 1791 but it is not possible to say which version. It has been suggested that since the heads of Canova and Tresham have been painted onto separate pieces of paper, stuck to a larger piece of paper and the rest of the pastel painted around them, this version is the prime version. 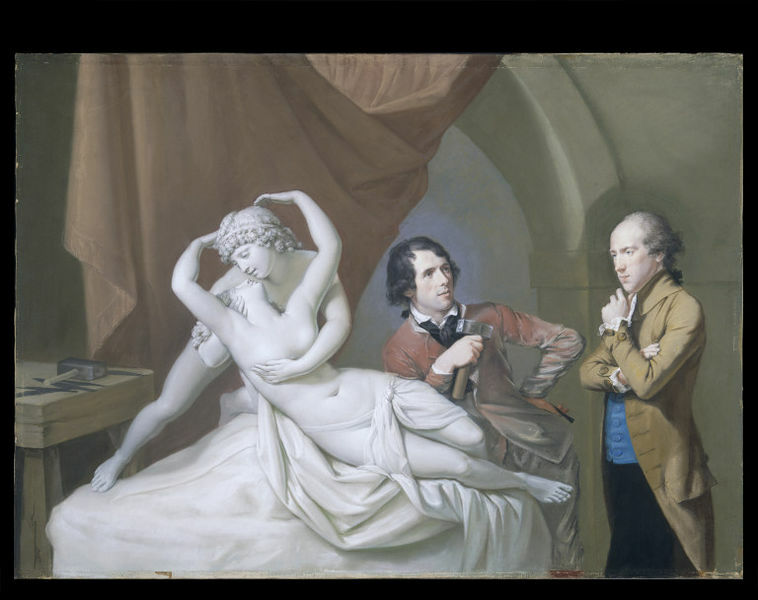 However, the Registered Papers 1997/880 carries transcriptions of letters from Canova to John Campbell about the sculpture and Hamilton's pastel from which it is possible to conclude that this version was painted later. Additionally, the hair style of Canova in this version is of a later date than the Cawdor portrait. Timothy Clifford et al, The Three Graces, 1995, repr.fig.1. Acquired for £524,400 by the Victoria and Albert Museum through Hazlitt, Gooden & Fox with a contribution of £262,700 from the National Art Collections Fund in honour of Sir Brinsley Ford. PROVENANCE: probably Marquess Wellesley, his daughter Lady Charles Bentinck; his granddaughter Hyacinthe, Lady Dalby, by descent to Hugh Farmar. EXHIBITED: Royal Academy, London, 1791 (380); National Gallery of Scotland, Edinburgh, The Scots in Italy in the 18th century, 1966 (32); National Gallery of Ireland, Dublin, The National Portrait Gallery, London and Ulster Museum, Belfast, Irish Portraits 1680-1860, 1969-70 (32); Royal Academy, London, The Age of Neo-classicism, 1972 (133); Tate Gallery, London, Grand Tour, the lure of Italy in the eighteenth century, 1996 (32). LITERATURE: David Irwin, "Gavin Hamilton: Archaeologist, Painter, and Dealer", Art Bulletin, 44,1962, p.87; Fintan Cullen, "Hugh Douglas Hamilton in Rome 1779-92", Apollo, 115,1982, p.87; Fintan Cullen, "Hugh Douglas Hamilton's letters to Canova", Irish Arts Review, 1, no.2, 1984, pp.31-2 repr; Nicola Figgis, "Irish Portrait and Subject Painters in Rome 1750-1780", Irish Arts Review, 1988, p.132; Anne Crookshank and The Knight of Glin, Watercolours of Ireland, works in pencil, pastel and paint c.1600-1914, 1994, repr. on cover and p.71; Anne Crookshank and The Knight of Glin, "Some Italian pastels by Hugh Douglas Hamilton", Irish Arts Review, 13, 1997, p.69; Timothy Clifford et al, The Three Graces, 1995, repr.fig.1. Antonio Canova in his Studio is widely considered to be the finest British pastel ever executed, showing both the full potential of the medium and the artist, Hugh Douglas Hamilton, at the height of his creative skill. Exhibited at the Royal Academy in 1791, it was the virtuoso piece with which Hamilton relaunched his career after a decade in Italy. It is a technical tour-de-force, exceptional in terms of size, grandeur of conception and finish. It is also in outstanding condition, which is rare due to the fragility of pastel. The V&A has a significant collection of pastels including examples of Hamiltons early modest ovals which were popular both in his native Ireland and in London where he worked from 1764. The acquisition of this picture adds a work of exceptional distinction to the collection, representing both a milestone in Hamilton's career and in the development of pastel as a public art competing visually with oil painting.